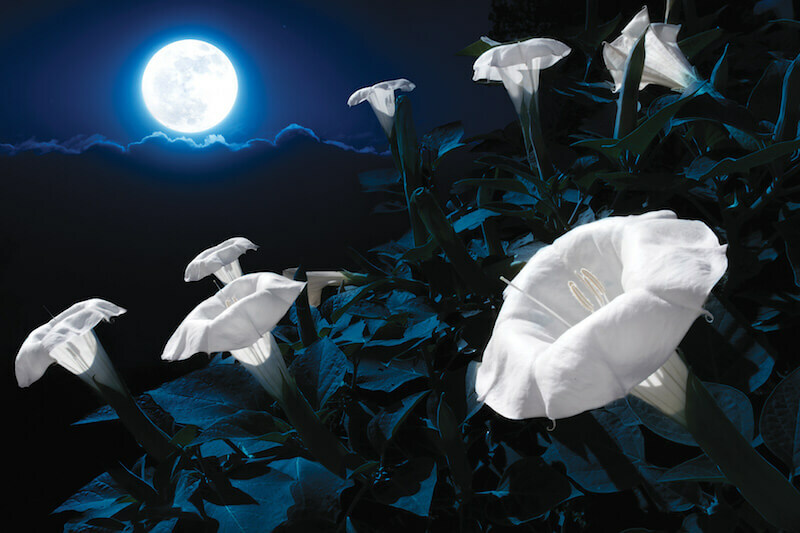 These 10 night blooming flowers show off their beauty at night so you can enjoy their subtle glow without flooding your garden with artificial light. Planting your own night blooming flowers will also help you get back in touch with nature. Instead of staying in at night to watch TV, why not spend some time in your backyard with your moon garden? The flowers will provide a beautiful and fragrant backdrop for any moonlight ritual you wish to forego. These plants have some of the most fragrant blossoms – and rightfully so. If not for a strong scent, they would never get pollinated. By emitting a strong fragrance, they lure in nighttime pollinators so they have the chance to bloom. This perennial spreads rapidly and can cover a lot of ground. The pale pinkish-white flowers open at dusk and release a sweet aroma. The hanging trumpet-shaped flowers make this plant a delight for any garden. This annual spreads like crazy, but it is also a tropical plant, so it grows best in zones 9-11. However, this plant can be grown in a container, and brought inside when cool. Be careful, however, as the plant is poisonous. This beautiful plant blooms at night and releases a lemony scent once opened. During the day, the white flowers are tightly shut. This plant can grow up to eight feet long, so make sure you have a trellis, or other support, so the plant will bloom. The flowers are 5-6 inches in diameter once fully bloomed. This is a great flower to add evening fragrance to your night blooming garden. It offers a honey-almond, vanilla fragrance that combines well with the sweet scents of angel’s trumpet or the four o’clock flowers. These orchid cactus plants have pure white flowers that open up to the size of a dinner plate when the sun goes down. They stay open all night, and close in the morning. The have a wonderful, unforgettable fragrance. The crimson red or purple water lily is one of the most magnificently coloured flowers in the world. They first open at dusk and close at about 9:00 in the morning. They are a great addition to any medium or large pond. This flower goes by many names, but the most popular is “Four O’Clock,” because the flowers open in late afternoon. They remain open until morning, and on cloudy days, they may not close at all. They are a bushy, tender perennial that can be grown from tubers or seeds. This annual is great for anyone who enjoys its fragrant scent. It is a member of the tobacco family and contains high concentrations of nicotine. The star-shaped flowers open up in late afternoon, and are on fragrant display all evening – perfect for anyone wanting to grow a moon garden. This woody evergreen shrub grows between 4 and 13 feet tall. It is cultivated for its fragrance, and the narrow, tubular, greenish-white blossoms only open at night. The flowers, which produce a strong, sweet fragrance, attract moths and butterflies.